I just found out that there’s a right way to eat an apple. I’m not talking about manners, but how to chomp on it so that you won’t waste half in the process. Essentially, I’ve just learned that I’ve been doing wrong what I considered to be a fairly common eating routine. So, how have I (and you too) been eating an apple to this day? Down to the core. Holding the top and the bottom with the fingers. Chomping from left-to-right (or right-to-left) until reaching the “inedible” core. But no, that’s not the way to do it. The one and only way to eat an apple (according to my friend Ryan) is to pluck the stem and bite right through the top of the apple. Or from the bottom, you decide. If you do so, you won’t even feel the core as you bite and you’ll eat it all...yes, all. It really works. You’ll probably discard (read this as spit out) the seeds and the little indentation at the bottom; but that’s how much waste you’ll generate. The notorious apple core will be something you’ll show a picture to your grandkids saying “That’s how we used to eat apples back in the days.” No more apple core, what a strange world to live in. Anyway, talking about the little black indentation at the bottom of the apple. Do you know that there’s a name for it? No, it’s not “little black thing”. It’s called the calyx or blossom end, which is where the flower was when the apple was tiny. If you look closely you can see some leaf remnants still attached there. Fascinating. 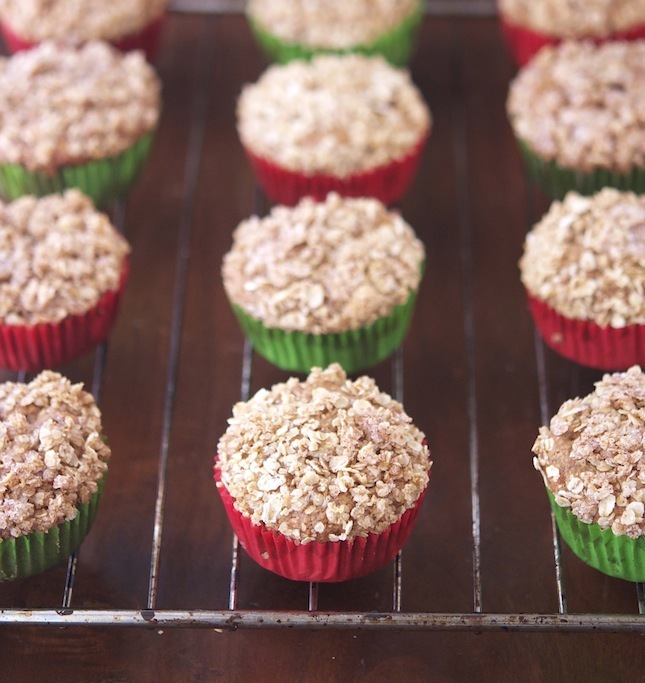 Now that I’ve instructed you how to eat an apple (and more importantly how to correctly name all apple parts), I think we can move on to the muffins. The recipe comes from my friend Courtney. She’s a model, actually a supermodel. Uber careful with what she eats. So, it should come as no surprise to you that these muffins are clocking in at only 144 calories each. Skinny model muffins. How to achieve this? Using applesauce (as a fat sub), little sugar and wholesome ingredients. Simple. Courtney is also vegan, which means that this recipe in the original version is 100% vegan. It works just as well using “regular” ingredients (I included the omnivore’s options btw). It’s your call. 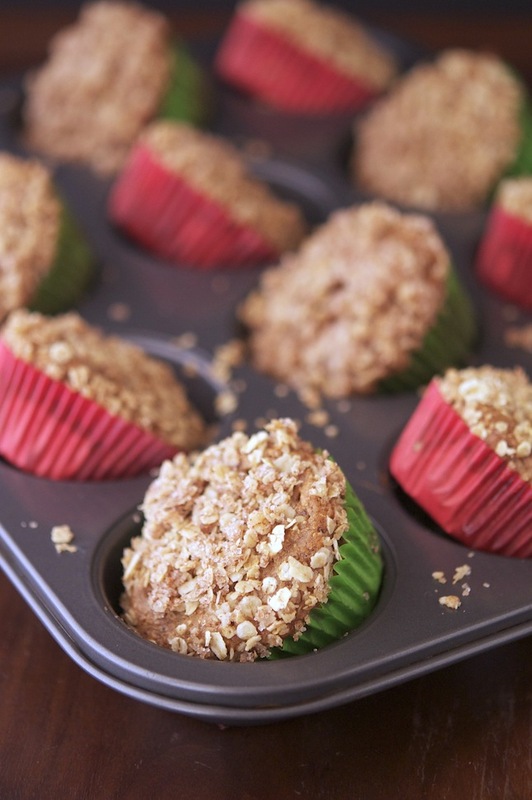 What you’ll get in the end are awesome muffins very appley and delicious. 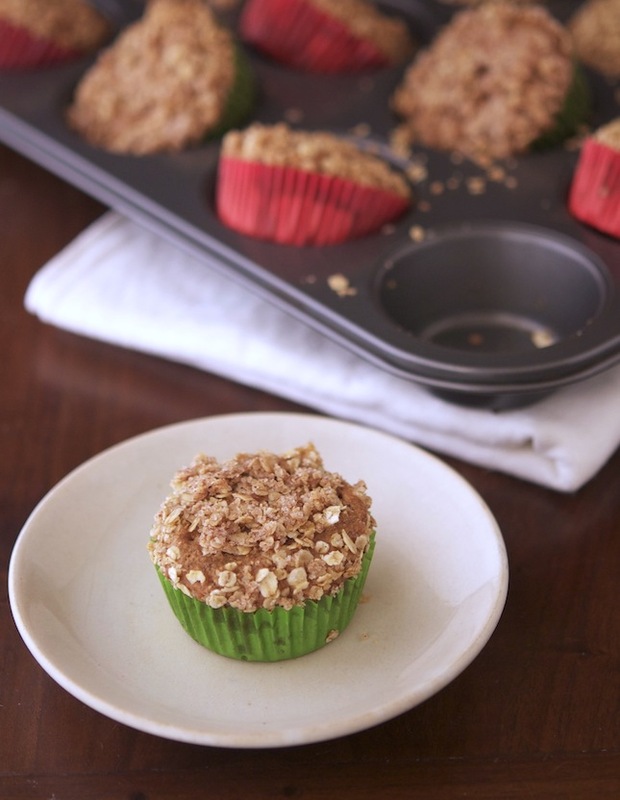 Apple Crumble Muffins Print this recipe! *To get soy buttermilk, you just need to add one tablespoon of white vinegar or lemon juice to a cup of soymilk and let sit for 10 minutes. Preheat oven to 325°F (165°C) and place a rack in the middle. Line muffin pan with paper liners (or grease and flour). In a medium bowl whisk sugar, flax egg and applesauce. Add baking soda, salt and vanilla and stir to combine. Add flour and buttermilk to applesauce mixture (alternating between the flour and buttermilk) and mix until just combined. Fold in diced apples. Divide batter among muffin cups (I used an ice-cream scoop). To make the topping combine all of the ingredients in a bowl and rub together with your fingertips until crumbly. Sprinkle generously! over the batter in the cups. Bake regular sized muffins for 30 minutes or until top springs back when touched. One muffin scores 144 calories, 5.2 grams of fat, 22.8 grams of carbs and 2.3 grams of protein. Yum! Can I have one please? Just 144 calories? Sign me up! I cant wait to make these this weekend! They look fantastic! Fantastic, can't wait to try these out! Can I sub the brown sugar for date sugar? Negative Calorie Food: Fact or Fiction?